For many it is the vivid account of where they were on December 7, 1941 when the Japanese planes descended upon Pearl Harbor. For many others they recall with clarity black and white images of Dallas, Texas in the year 1963 and the words of a stunned Walter Kronkite, “The President has been shot”: words that have replayed over in their minds as they recall exactly where they stood, what they were doing, and when they heard the news of President Kennedy’s assassination. On September 11, 2001, yet another generation would experience the unthinkable and would be handed the same unforgettable and heavy memory to pass along to their children and grandchildren. American flight 11 takes off from Logan Airport in Boston at 7:59 A.M. for Los Angeles, United flight 175 takes off from Logan airport in Boston for Los Angeles at 8:14 A.M., American flight 77 takes off from Washington D.C. for Los Angeles at 8:20 A.M. and United flight 93 takes off from Newark New Jersey bound for San Francisco at 8:42 A.M. At 8:46 A.M. American flight 11 crashes into 1 World Trade Center, at 9:03 A.M. United flight 175 crashes into 2 World Trade Center, at 9:37 A.M. American flight 77 crashes into the Pentagon, and at 10:03 A.M. United flight 93 crashes into a field in Shanksville, Pennsylvania. The New York skyline was penetrated with aggression. Washington D.C. was attacked at the hub of our National Defense. Brave Americans sacrificed their lives over the serene countryside of rural America, bringing down a plane saving untold lives in our nation’s Capitol. When the dust settled and the sun set on that day, 2,985 Americans had died. 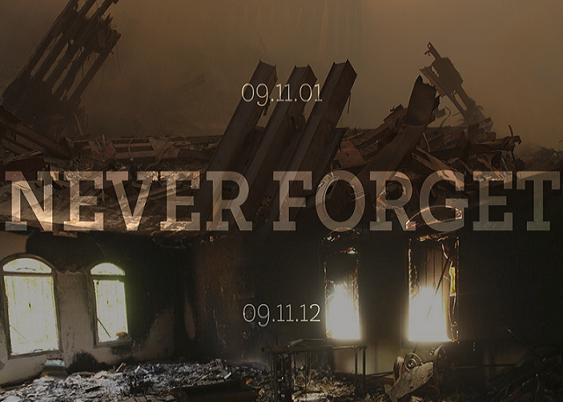 They did hear from us, and though 13 years have passed, the memory still remains vivid in our hearts and minds. May we never forget the heroism and courage of soldiers and first responders alike that answered the call that day and are still protecting us this very hour. May we never forget the God we called upon that day and who still is blessing this great land. The Scriptures remind us of the grand truth our Founding Fathers knew well: “Blessed is the nation whose God is the LORD, the people he chose for his inheritance” (Psalms 33:12). From the incredible bravery found in the blue skies that morning to the selfless sacrifice of those rescuing colleagues and fellow soldiers in the World Trade Centers and the Pentagon, our hearts will forever be shaped and our minds will forever be focused on that day. Americans will stand and defend freedom, and Americans will move forward with courage and determination committed to remembering the past and preparing for the future. Together we look forward to a day without fear, a day of blessing and peace, when we are motivated to live more trusting of our Creator as we build a better future for today and for those who follow in our footsteps. May we as a nation never forget. Tim Throckmorton is the Pastor of Crossroads Church in Circleville, Ohio. In 2010 he released a DVD project entitled Lest We Forget, followed by a companion book in 2011. His latest book, Jesus Hit Me, was released in the fall of 2013.